Before visiting, I saw this place pop up quite a lot on Facebook and Instagram. From the pictures I had seen, the food here reminded me of the kind of thing you would see on Man V Food. 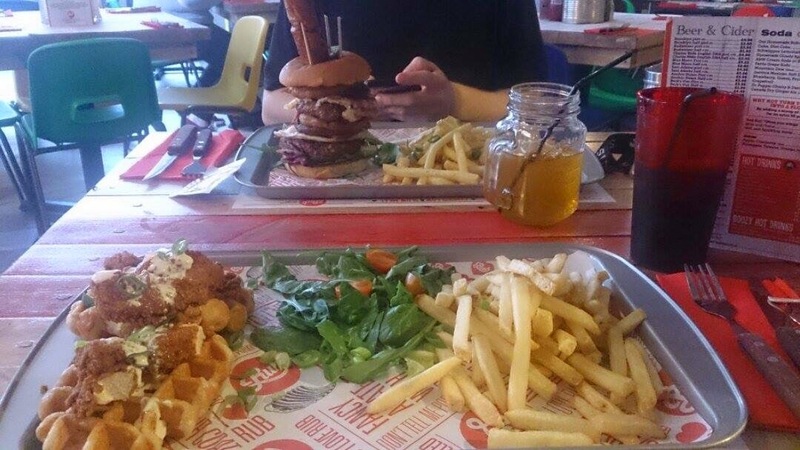 Over the top American style dishes with huuuuuge portions! Plus, it was only in Nottingham! I visited midweek at lunch time, it wasn't very busy so assume this place must really pick up at night & there is plenty of seating. The interior is quite different, not like I have experienced before with multi-coloured primary school style chairs and tabled made from wooden pallets which towards the end, did get uncomfortable. Upon arrival, the staff were welcoming, but it was slightly confusing to establish who was a diner and who was staff as they didn't have any kind of dress code or uniform and we were taken to our table. We were able to chose which one we wanted as it was quite quiet at this point, it soon got busier as hungry shoppers stopped by. I was amazed by the choice of drinks. Anything from a diet coke (which teetotal, unadventurous me went for) which is served in the American style red cups, to fancy cocktails with candy floss on them! Ashlea had a home made bottomless iced tea which comes served in a mason jar. I've never had such a hard time choosing what to have to eat, the choice is unreal. The menu is big and I mean big. After looking at other people eating in the restaurant, I didn't want a starter as I wasn't sure I would even be able to finish my main. I went for fried Chicken and waffles which came with maple syrup and a side (fries) - very unusual but so good! 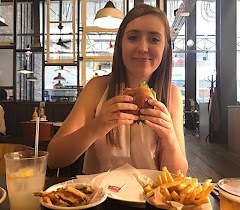 Ashlea had a burger called 'The 51st State' which was a burger with two 6oz cheeseburgers, a steak (cooked correctly), mushrooms, bacon, two eggs and onion rings all held together with a corn dog spear and a side of fries! We both really enjoyed our meals, but I didn't really understand what all the hype was about. Desserts were tempting but I couldn't possibly have one. One did intrigue me though, titled 'The kitchen sink' it was actually served in a full sized metal sink! It is a sharing dessert and comes overflowing with ice cream, marshmallows, Oreos, bananas, brownies, chocolate, waffles wafers and sauce. All topped off with sprinkles and a cherries. If I was to visit again in a group, I would definitely want this. Overall, I think I would visit again, but I'm not in a rush. There are plenty of restaurants in Nottingham that are a lot better and still a lot of places I am yet to try.